Present state: Station building is demolished, and a new station entrance, for the replacement Partick station, sits almost exactly on the site. The site of the station can be identified from a passing train as the tunnel widens at the site of the station. Notes: Merkland Street was opened in 1896, as part of the Glasgow district Subway, which formed the basis of toady's Glasgow Underground. The station was situated on the north of the river, and proved very popular, especially during the shipyards era, with workers going from one side of the river Clyde to the other! When the Glasgow Corporation Transport decided to replace the cable haulage with electric traction, reusing the existing cars, trials were carried out between Merkland Street and Copeland Road (now Ibrox) Station. To allow this, the original timber platforms at Merkland Street, Govan Cross, and Copeland Road, had to be rebuilt in concrete. 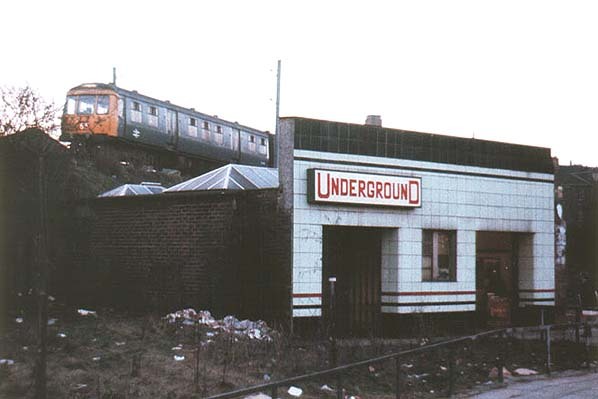 By the 1970's the Glasgow Underground was run down, and in desperate need of refurbishment. The Greater Glasgow Passenger Transport Executive, whose predecessors, Glasgow Corporation Transport, had acquired the subway in 1923, were given authority to modernise the subway in 1974, and after funding and planning had been sorted out, the scheduled closure was set for 28th May 1977. 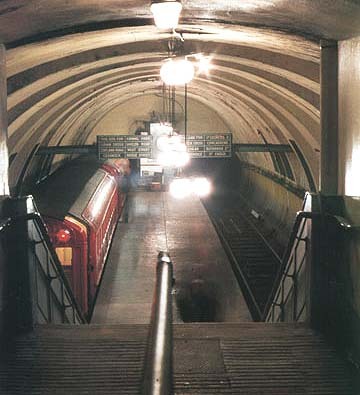 As part of the plans, 14 of the stations were to be modernised, and five of those were to be excavated, and rebuilt, with flank platforms, rather than island platforms. The 15th station, Merkland Street, was to be closed, and replaced by a new station, just under 25 metres away, called Partick. This new station, which would also have flank platforms, would interchange with Scotrail's North Clyde electrics. The reason for building a new station was that, had the Merkland Street site been retained, it would've been difficult to build new stairs or escalators, through the embankment, that the BR line sits upon, for new flank platforms. Hence, the decision was made to build a new station instead. 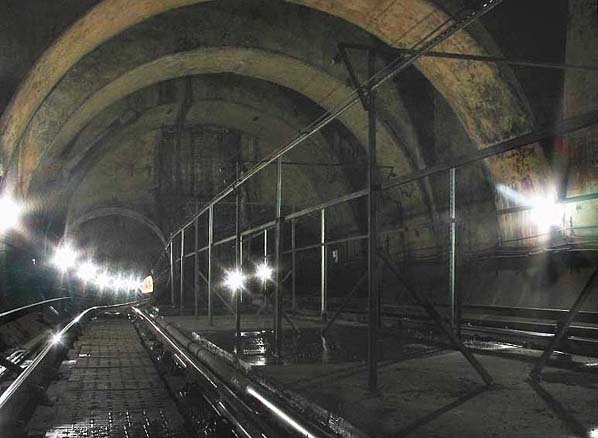 Merkland Street ended up closing a week early, after cracks were seen in the roof of Govan Cross (now Govan) platform chamber, as a result of preparatory work for the new flank platforms there. The GGPTE decided not to resume the service until after the modernisation had been completed. This was on the 16th April 1980. After the system closed for modernisation in 1977, the Glasgow Museum of Transport, which was then based in the former Coplawhill tramcars works, carefully dismantled the station masters box, which was then on the platform; it contained circuit breakers and other items - the box now forms a subway exhibit. The Merkland Street T-irons, which provided lighting for the trains and controlled the signalling, were also removed; under the modernisation, with pointwork to reach the depot, the t-irons were obsolete. The destination gantry and clock were also removed, and taken for storage by the museum. When the Glasgow transport Museum moved to it's new site at the Kelvinhall in 1983 (1/4 away from Kelvinhall subway station), the subway exhibit was rebuilt into a 1930's street scene. The exhibit consists of an island platform, the destination gantry, the station masters box, and some old subway cars. One is car 1, another is trailer 39 and the third is 1/2 of car 4. Further reading: Circles Under The Clyde - A history of the Glasgow Underground by John Wright & Ian Maclean, published by Capital Transport, ISBN 1-85414-190-2. For information about the Glasgow Subway today see the Strathclyde Partnership for Transport (SPT) web site and click on 'subway'. The New York City Subway web site also has a page on the Glasgow underground.